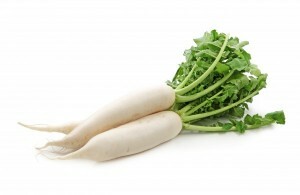 (Raphanus sativus) Pure white, uniform, cylindrical roots with a crisp, mild flavor. Known as mooli in Hindi. Matures in 60 days from sowing. Can be left in the garden 15-25 days after maturity, without losing flavor. Medicinal uses include liver conditions, enlarged spleen and jaundice.